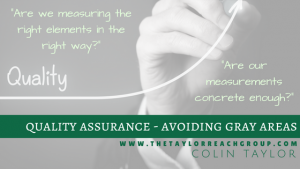 Quality Assurance - Avoiding Gray Areas | The Taylor Reach Group Inc. In terms of the right elements, there is always a danger that our internal scorecard becomes too inwardly focused and we lose perspective on what is really important to the customer. That is why QA programs need to be informed by Customer Satisfaction (CSAT) and CX evaluations to represent the customer perspective.